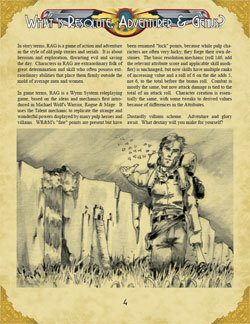 Resolute, Adventurer and Genius takes the core of the Warrior, Rogue and Mage system and resets it in the pulp genre. This is far from sacriledge - what makes WR&M delightful is that your character's primary attributes are constructed as of proportions of typical fantasy archetypes. There is no reason this premise could be see through the coloured glass of Sci Fi, horror or The Great Typewriter Monkey Rebellion. The title of the game denotes your three attributes: Resolute is strength, toughness and courage; Adventurer measures intuition, agility and charisma; Genius is mental acumen and creativity. Each measured between 0 and 6, although 0 in each would mean your a clumsy coward with all the intelligence of a potato. You build you character by distributing 10 points between them. Skills give your character a role in the team (you start with 3) and a Talent gives you a certain ZING!. There's a small list of Skills - because RAG (like WR&M) isn't really about Skills. Talents are where things get interesting and it has one of those lists which cannot help but suggest cool characters to play. For any sixes that are rolled, add 5 to the total and roll again. If you keep rolling D6s, keep adding 5 and rolling again. That's called exploding die. You don't actually have to make the die explode. Opposed checks are bigger-score-wins. Combat and healing is along these lines with hit points keeping track of damage. Luck points can be spent to change the game world, avoid a take, reroll a die or add +2 before the roll is made. All good mechanic options. You regain luck by being heroic. If you're playing a party of villains, you get points for villainy. Such as kicking cats, punching old ladies or laughing maniacally on mountain tops. 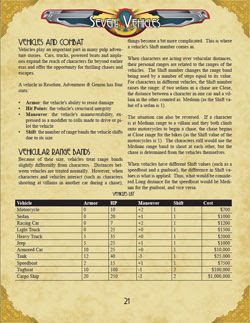 A welcome sight are some natty vehicle combat rules, which add just enough crunch to be interesting. RAG uses the chase as its vehicle combat rules, which fits snugly into the pulp theme. I heartily chuckled at the list of vehicles provided, which includes a Cargo Ship, Dirigible and U-boat! Letting my players see a U-boat in a list of vehicles will automatically generate the goal "Let's by a U-boat". That poor fellow (or madam) perched at the end of the table often needs as much help as they can get. The GM is provided with pulp in the 1910s/20s/30s/40s, a bestiary, help giving out XP and words of wisdom. It even has a back cover for the new player to glance over. The book is beautifully presented, has a back cover and contents, its license is Creative Commons, it reads well (no glaring errors). There's even a print friendly version that is black and white. I love you chaps! There are niggles. There always are. I would add more skills appropriate for genius characters, such as a skill specifically for dealing with the arcane. I'd use the Creative Commons CC-BY-SA logo on the website. I'd rename the PDF downloads so that they were instantly recognisable as RAG. Finally, I would add an example setting. It nearly has one but in an attempt to please all audiences with the different decades, it's actually made it more difficult to play. 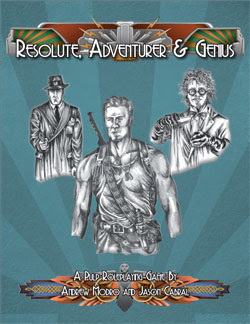 Resolute, Adventurer and Genius is everything its title is cracked up to be. It is a strong game with charisma and a clever lilt to it. You will need to bring your own setting and adventures to the RAG party but once you've partied hard with this system you'll find yourself waking up in bed with a beauty; not on the dawn train to Scotland with hate gremlins drilling your skull.